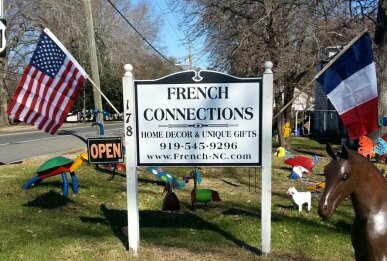 Since Oct 2000, French Connections has been bringing you an eclectic variety of fabrics, antiques, table linens, art, and crafts from France, Mexico, and about 20 African countries. We’re proud supporters of sustainable, ethically-traded products of the highest quality, directly sourced from artists, small manufacturers, and personal contacts from around the globe. Whether you shop online or in our Pittsboro, NC store, we promise to do our best to answer your questions and satisfy your needs. Click the sign to take a virtual tour! Or watch UNC-TV's segment on the store for NC Weekend! Interested in news and coupons? Join our email list, below.